It's possible to have a broken foot and continue with your normal exercise routine, but it's not recommended. Bone fractures need to be stabilized to give them time to heal properly. You'll most likely wear a brace to immobilize your foot and need to stay off it for a period of time. With crutches or a walking brace however, you can create a workout plan to keep yourself in shape while your foot heals. Always defer to your doctor's orders when planning an exercise regimen when you have broken bones. Find exercise plans that are not weight bearing such as swimming. 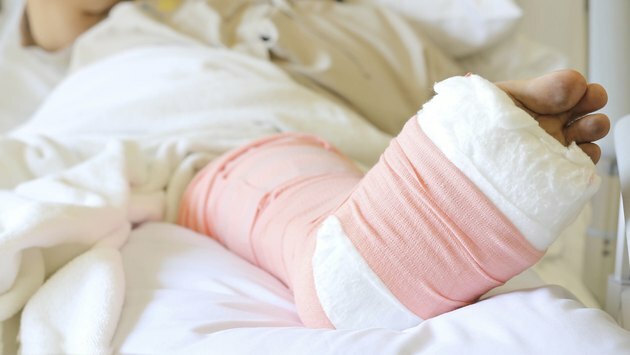 As long as you aren't fitted with a cast, you can get in the water and easily keep your weight off your broken foot, according to the American Academy of Orthopaedic Surgeons. Hold on to the sides of the pool and kick your legs. Use a kickboard if you feel pain when standing in the water. Lay your legs over the kickboard and perform swim strokes to work out your upper body. Stay in the deep end of the pool and tread water to work up an aerobic heart rate while building upper body and leg muscles. If you have a stress fracture, your doctor may allow you to continue with weight-bearing exercises on alternate days. Resume normal exercises slowly, gradually building up the intensity and duration of the activity. The more pressure you place on the fracture, the more likely you are to increase the break and incur additional complications. Avoid intense high-impact exercise and instead ride an elliptical trainer every other day and work out on a stability ball doing crunches and pushups on alternate days. Always include a rest period of at least 48 hours between specific workouts while your broken foot heals. Improper or worn out footwear may have played a role in your injury. Even if it didn't, when you resume exercising, you'll want to make sure you have the right kind of shoe to support your foot properly and prevent complications while your broken foot continues to heal. Ask your surgeon about orthotics to place in your shoes to ensure you maintain a proper gait. Additional padding in your shoes can soften the stress your weakened foot undergoes, allowing you to begin walking and slowly return to running, jogging or sports that require more high-impact foot placement. A stationary bike is the safest form of cycling during the first four to six weeks of your recovery from a broken foot. On a stationary bike, you don't run the risk of falling or having to rely on your injured foot to prop you up. Cycling on an upright or recumbent stationary bike is effective for building thigh and calf muscles you'll need to support your body as you resume more normal exercise activities. You can get your aerobic workout with very little impact or strain to your injured foot. Consider taking up cycling outdoors once you're recovered if you are prone to problems with your feet.